With each challenge here at Crockern, I am comforted by our small accomplishments. We may still have sheep coming into the yard, but not all of it; and, 3 or 4 sheep is a far cry from the original 30 who were here before we started repairing the walls. We’ve lined up a few professionals to assist on projects that are out of our skill set (roofs and electrics). Our vegetable beds are nearly ready for winter planting. We’re slowly making headway on upgrading our plumbing works. The place feels comfortable, as if we’ve lived here for a long time. 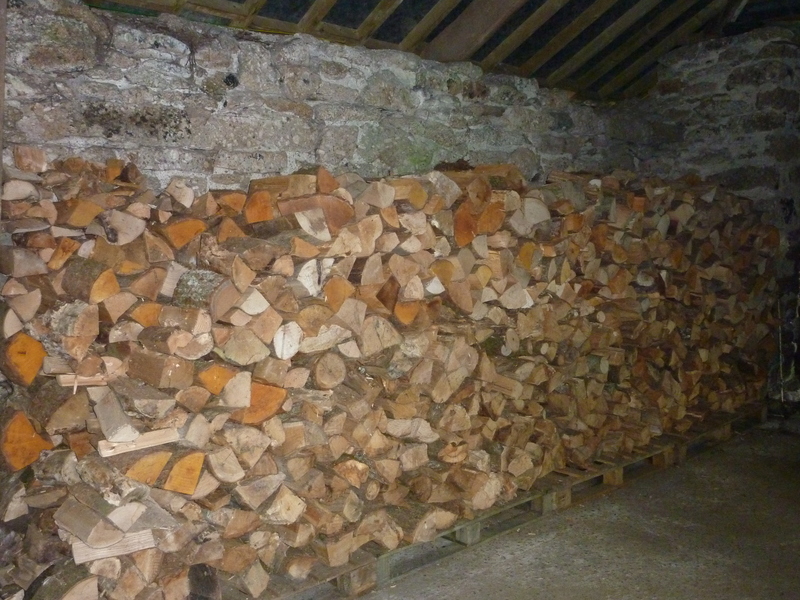 And, in preparation for winter, we’ve installed a wood-burning stove and amassed an impressive store of wood. That dynamic balance between accomplishment and challenge spans a lifetime. When I was a girl, I wanted to give my oldest brother a terrific Christmas gift. I spent what I remember as weeks cutting and stacking logs to give Russ a pile of wood for his fireplace. I would find a fallen tree in the woods behind our house, saw it into the right size logs, lug them and neatly stack them into place. I don’t think any of the logs were so thick they had to be split, but if they did, I’m certain my Dad helped along the way. 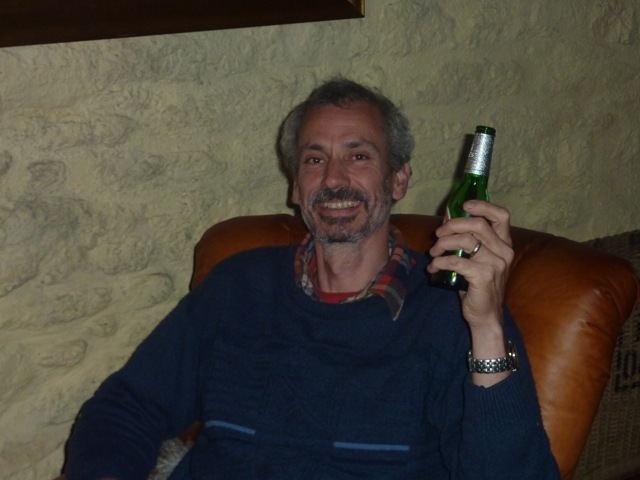 I had given this gift considerable thought and part of the fun was how Russ would discover his present. He’d open up a little wrapped box to find a clue inside which would lead him to the start of a string. He would then have to follow the string through the house only to discover his amazing gift outside. I spent weeks planning, cutting, stacking, and creating what seemed like a pretty respectable pile of wood. One day when I returned from school, ready to do some hard work on that slow growing woodpile, I found that it was suddenly half its size. Horror! Here is where memory diverges between the two of us. When I saw the woodpile was reduced significantly, I knew that Russ was pilfering it for his own use. And who can blame him? A pile of wood is not an obvious Christmas gift and what’s an armload or two, tossed into the back of the truck to take home? He steadfastly denies taking the wood. I say, the brother doth protest too much. After almost 40 years, Russ and I still don’t possess the same memory regarding the mystery of the diminishing Christmas gift woodpile. There are no witnesses to confirm either of our versions. But, do the precise details really matter after all this time? Regardless of how it happened, the pile was not gift worthy in size and Christmas was around the corner. At this point in the tale, and faced with this situation, I believe Russ and I will both agree as to what happened next. I resorted to classic pre-teen behaviour and broke down into tears. Russ must have been put on alert with a call from parents because he arrived the next day, and without comment, proceeded to cut and stack a respectable pile of wood. As we worked quietly side by side, I felt a sweet relief in his penance. I also felt a certain smugness, knowing that he was unaware of cutting and stacking wood for his own gift. Of course, having to suppress this kid sister’s indignation topped off with a desire to blab about the gift was nearly impossible. 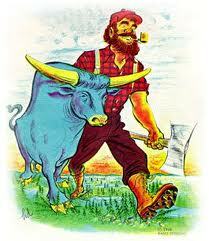 To this day, I’m not certain who laboured harder: Russ with his Paul Bunyan determination or me with my emotional mix of guilt-glee-must-keep-a-secret. Either way, when gift opening time came along, Russ was a hero and acted surprised. With any luck, he got 3 fires out of it, as the pile wasn’t really that big. 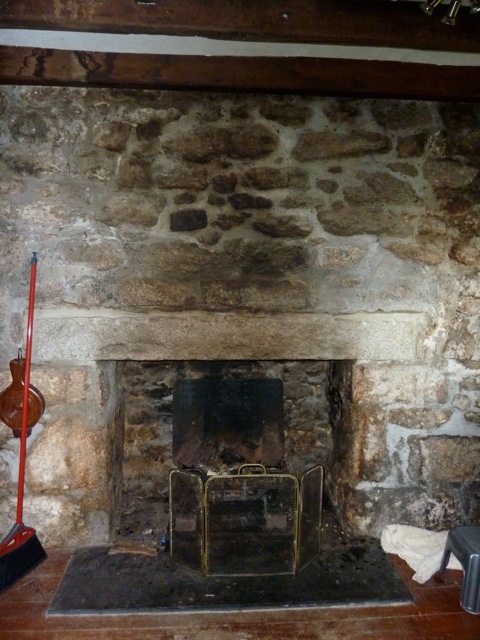 The fireplace here at Crockern when we first moved in was an open fire, with a flue straight up to the sky. Rain, bird nests and other bits regularly fell down. I don’t believe it had been swept in decades, so in addition to being a fire hazard, it was also dropping bits of vulcanized soot and ash. When it rained, rainwater fell directly onto the fire grate. When the wind blew, the smell of old smoke filled parts of the house. And when a fire was lit, the heat went right up the chimney drawing behind it a nice draft through the house. In short, it was a mess and we knew we had to change this right away. 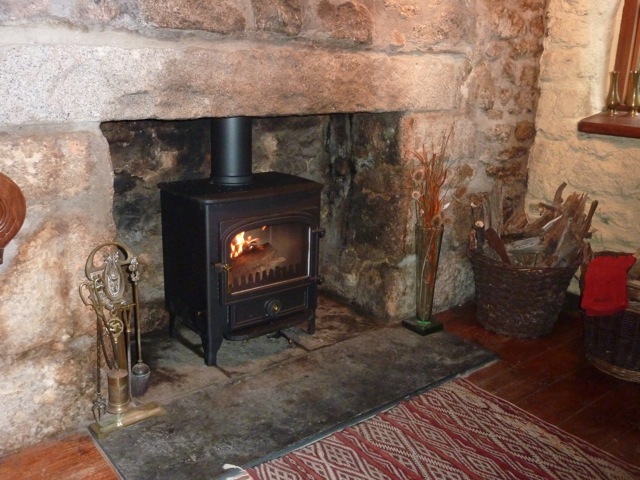 For many people, the main reasons for installing a wood burner are that they provide a lot of warmth and look aesthetically pleasing, without the hassle, smell, soot or even risk of an open fire. They facilitate that basic desire to feel warm and safe in our homes. They are cheaper to run than conventional heating systems and they are considered pretty green since the wood is a sustainable fuel source. For me, it’s not really about tree-hugging to gain eco-cred out in the world. It’s much simpler. I just feel lucky if I can live in a house with a fireplace. The bonus of a wood-burner is that I can light it in the morning and then head out with the dog, returning to a nice warm fire. Nothing beats that cozy feeling, especially when it is cold and wet outside. 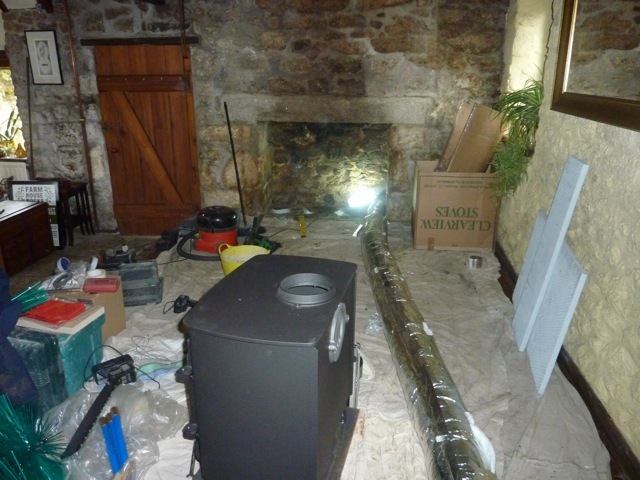 To prepare for the wood-burner’s installation, we had to empty the fireplace of its wet wood, coal, soot, birds’ nests, and other unknown bits of debris. The chimney was swept, releasing around 20 pounds of black crystallized gunk that was bagged up for removal. Then there was the cleaning. A day scrubbing with a wire brush and water eliminated years of soot and carbon transforming the granite stones on the wall and around the mantle. So once again, I find myself amassing woodpiles for winter. Not for my brother this time around, instead, I’m behaving a bit like a squirrel and getting ready for winter. 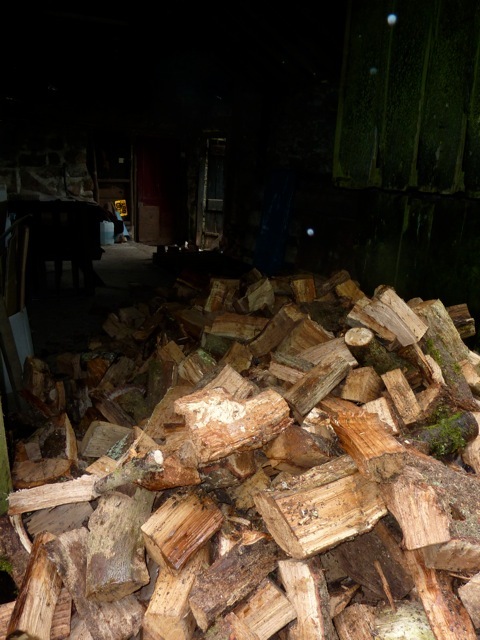 Once the wood-burner was in place, I ordered a double load (4 cubic metres) of wood. After stacking it neatly in the barn, I began to worry that we didn’t have enough. What if it snows a lot or is super cold this year? So in the middle of August, I ordered a second double order, and spent an afternoon adding to our stash. The three rows are neatly stacked, with air able to circulate around them. The barn is dry and we went to the trouble to raise the wood up onto wooden pallets, to keep air coming in underneath. All in all, I’m feeling stocked for winter. The stove is a work of beauty with a clear window, nice heat output, and no smell of smoke. There is no longer a draft of cold air moving through the room, instead, a warm and steady glow after the fire is lit. At the end of a long day, if it is at all cold outside, nothing beats sitting in front of it. Once we get an electrical outlet in the room, we’ll even be able to read by the fire. But, that’s a project for another day…..